Project collaborators who do not have administrative privileges must be assigned a scene before they can export it. Likewise, they must still be in ownership of the scene when they're done making changes to the scene and want to import their version back into the database. Hence, it is important to assign each scene to the user who is expected to work on it. NOTE For more information on user types and privileges, see User Types and Restrictions in WebCC. 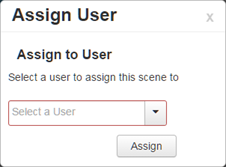 Select Scene > Assign User. Right-click and select Assign to User. The Assign User window opens. Select a user to assign to the scene.